It’s Friday night and you’ve got a choice. Before you meet up with your friends, do you do fit in a HIIT workout or take the dog for a leisurely run? You know your buddy would love the extra attention, but taking the slow-and-steady route feels a little like cheating. When you push through a fast and furious series of intervals you can really feel the burn. All the sweating and heavy breathing must mean it’s a better workout, right? Not necessarily. The difference between high intensity interval training and a brisk jog is a matter of anaerobic vs. aerobic exercise. Your body can benefit from both, but the one on which you should focus depends on your goals. Anaerobic vs. Aerobic Exercise: What’s the Difference? In practical terms, whether or not an exercise is aerobic or anaerobic hinges on its duration and intensity. 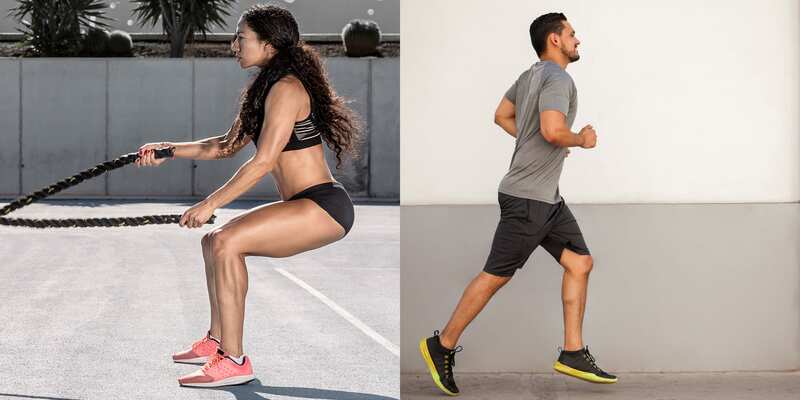 According to kinesiologist Frances Lee Smith, M.S., PN1, anaerobic exercises “can only be done in repeated, short bursts, and requires a decent amount of recovery [between them].” To work at this level you’ll go hard for each burst of activity, working at a pace you can maintain for up to two minutes. Examples of anaerobic exercise include HIIT, plyometric exercises, and weightlifting. Aerobic exercises, meanwhile, are generally performed “at a low or moderate pace for an extended period of time,” says Smith. In practice, that usually includes activities lasting longer than two to three minutes, and generally encompasses what trainers refer to as low-intensity exercise and steady-state cardio. Examples include walking, cycling, and long distance running. If you’re doing repeated bouts of short-duration work (sprint intervals, squats, curls, etc.) anaerobic respiration remains your primary method of energy production. The reason is that its production speed is very fast — indeed much faster than aerobic respiration — allowing it to meet the immediate, high demand for energy from your muscles. But if your exercise bout lasts longer than two or three minutes, aerobic metabolism (which has a greater production capacity but slower production speed ) has time to get up to speed, and it takes over. Here’s an overview of how the three energy systems (phosphagen, glycolytic, and oxidative) come into play during exercise. Anaerobic vs. Aerobic Exercise: Which Is Better for Your Goals? “I would recommend a mix of everything,” says Smith. “It’s important to tax the heart and the body in different ways,” she says. That means a balanced exercise program for general fitness should include both anaerobic and aerobic activities, as they tend to build different skills and produce different results. Anaerobic exercises typically enhance muscle strength, power, and size, as well as overall speed. Aerobic exercises typically help build endurance and have a greater affect on cardiovascular health. Even if you’re focused on goals that are aerobic in nature, like running a half-marathon, doing anaerobic exercise can help you perform better. Strength training, for instance, can help runners improve their speed, economy, power output, time to exhaustion, and potentially even VO2 max — not to mention decrease their risk of injury. If your primary focus is strength training, meanwhile, performing light aerobic exercise between workouts can help optimize your recovery. If your goal is weight loss, however, the exercise type that science recommends might surprise you: Anaerobic. “Studies show that anaerobic exercise typically produces greater fat loss than aerobic exercise, and that’s largely because it keeps your metabolism elevated for longer after you work out,” says Thieme. That idea bucks popular (non-science based) wisdom, which holds that slow and steady exercise wins the fat loss race. But if you think back to the idea of creating an oxygen deficit, it begins to make sense. When you perform anaerobic exercise, you never make up that initial oxygen deficit by switching over to aerobic metabolism, as you would during, say, a distance run. In fact, your oxygen deficit compounds, ultimately becoming an oxygen debt. The process of repaying that debt keeps your body’s metabolism elevated for hours (or even days, according to some studies) after you stop working out. The white coats call this phenomenon excess post-exercise oxygen consumption, or EPOC. You might know it as the “afterburn effect.” Either way, the bottom line is this: Aerobic exercise might burn more calories during a workout simply because such workouts tend to last longer, but anaerobic exercise typically burns more calories overall, because it keeps your metabolism elevated for much longer after you’re done. To be clear, a heart rate monitor is the most accurate way to determine if you’re exercising in the anaerobic or aerobic zone. “Once you push past 80 percent of your maximum heart rate, you’re anaerobic,” says Thieme. If you don’t own or have access to a heart rate monitor, try the talk test. “If you find it difficult to speak even in short sentences, or if you would rate your exertion 15 or higher on a scale of 20, you’re exercising anaerobically,” says Thieme. If you can carry on a conversation, you’re working aerobically. Your goal is to walk the line between pushing yourself hard enough to optimize your progress and pushing yourself so hard that end up sidelined by overtraining. “The talk test will help keep you on track,” says Thieme.